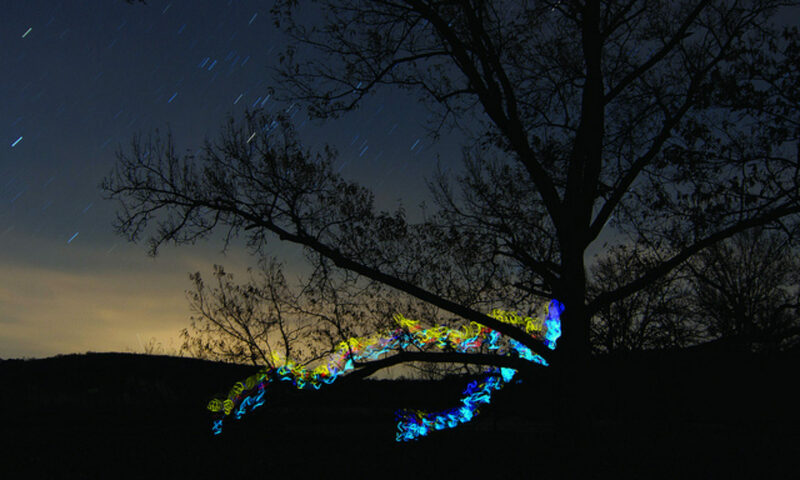 This week’s entry contains images of a natural phenomenon so spectacular and unbelievable! I can’t wait for you to see them and tell me what you think. It was a truly incredible sight and I feel so lucky to have witnessed it before the weather warmed and made it all disappear. Enjoy! DAY 979 12.08.09 – At Drew’s house on a cold and rainy night. I ran out of his house and up to Frankfort Ave. I took a left and spotted this small but gnarly looking tree along the sidewalk. Three main limbs split low at the ground and one went up and the other two angled out sharply and twisted around one another. I crawled carefully up those two and stopped on a nice wet seat. 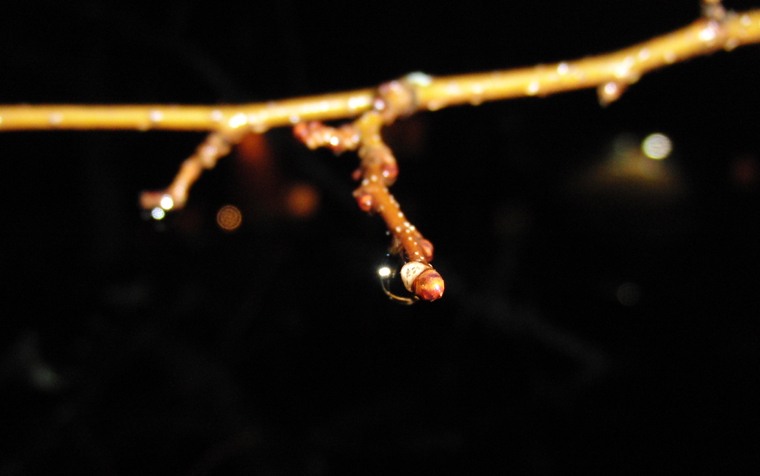 I took some quick picks of my dark view lit by the few street lights and then tried my hand at some macro shots with flash. Most turned out awful as the camera couldn’t figure out how to focus in the dark. And of course my first shot was the best of the whole bunch. 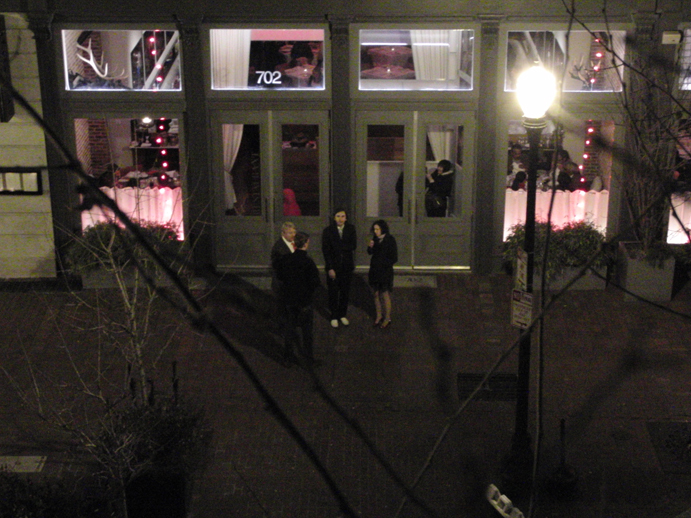 Then I put my camera way, climbed down carefully, and ran back to Drew’s. DAY 980 12.09.09 – Oh, what a cold cold windy day! 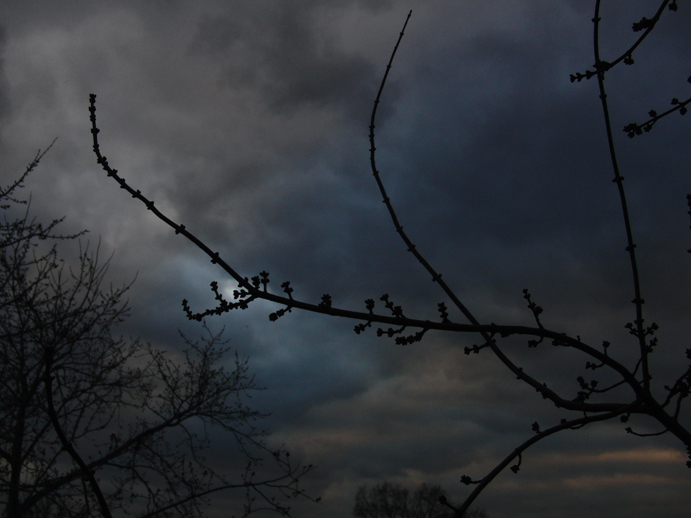 It was dark with stormy and fast moving clouds. But it never rained, it just blew and bit. I went to order a print at Unique Imaging in Germantown then went to George Rogers Clark Park to climb. It was pretty deserted and I ran around to warm up as I looked for a tree. Over by the bathroom building I spotted a large tree with wide trunk that had rigid bark and a high first limb. I had been meaning to work on my shimmying and this would be my biggest challenge yet. I prepped myself mentally and knew it would be even more of a challenge with this biting cold on my bare hands. As I got started a few teens over by the bathrooms started to approach me and the tree. They asked if I was planning to be on Man vs. Wild or some show. I ignored them as I made my slow progress up the trunk. 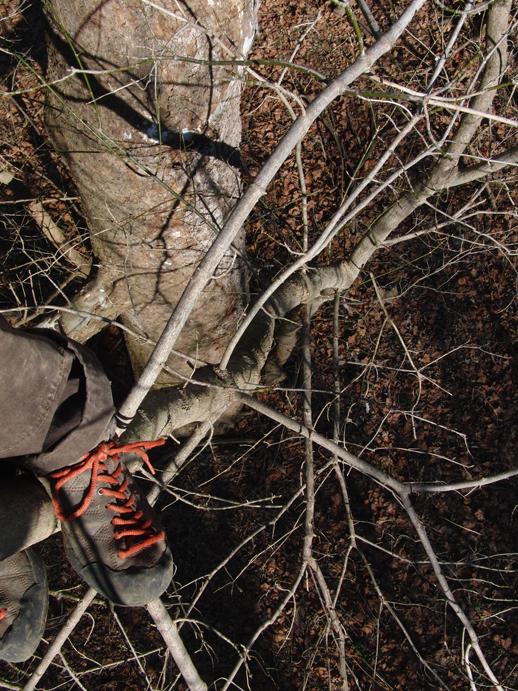 I was just under the branch and squeezed tight with my legs and reached my left arm over the limb. It was wider than I had anticipated and I struggled to find a decent grip with my numbing fingers. In a panic, I put my arm back around the trunk and decided I had to slide down before I fell down. I slid and hugged and then pushed off and when I hit the ground rolled. 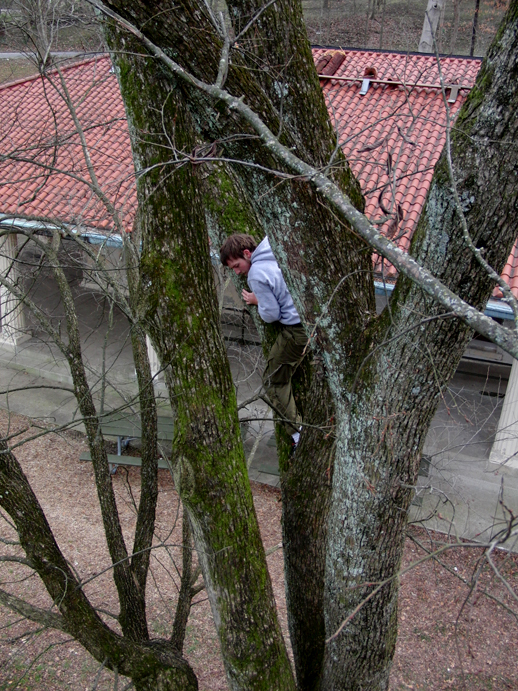 The rest of the group of teenagers were now right there asking what the hell I was climbing trees for. I just said for fun and that I needed to find another tree. 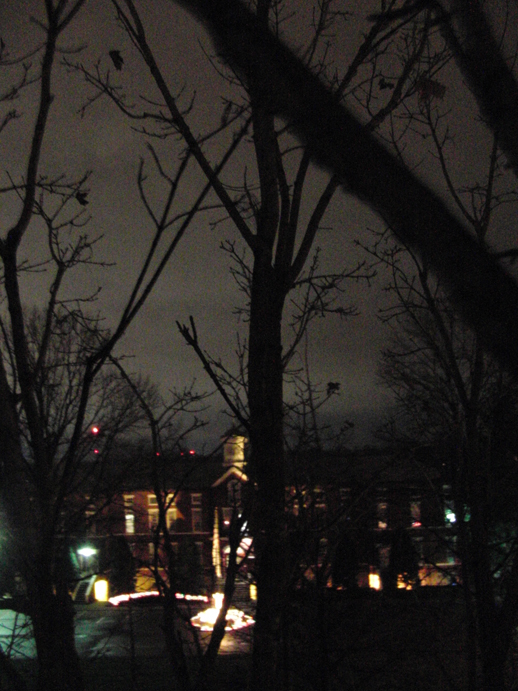 I tried my best to warm my hands before climbing another tree near the basketball court. It was an okay challenge but I was determined to come back to that first tree when it gets a little warmer. DAY 981 12.10.09 – Thursday night. Drew asked me to join him at Proof in the 21C Hotel from some food and drink. We had some delicious fair and imbibed some tasty spirits. Morgan Hamilton was our server and she chatted with us when she could. It was a nice night but bitterly cold again. After we finished I headed out the door and across Main Street. Drew smoked a cigarette and climbed the small tree on the corner. As I went up there were a group of three watching. At the top the woman told me to be careful getting down. I said hello and told her I’d be fine. 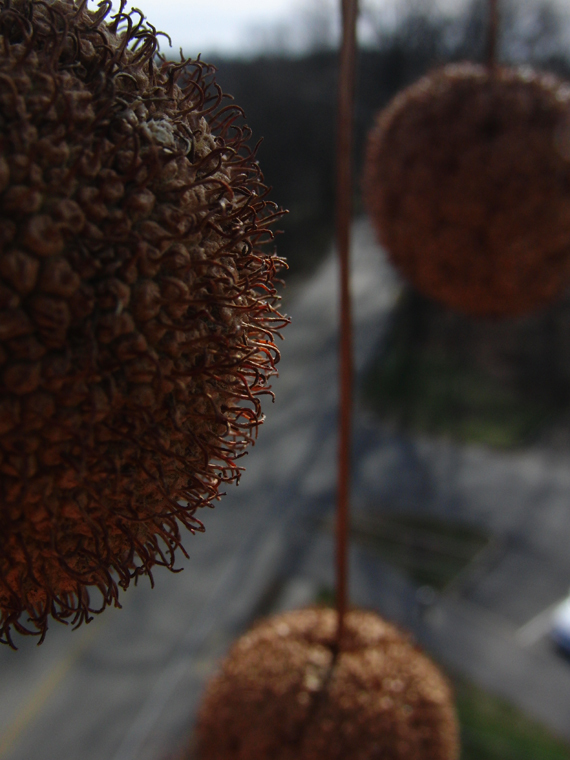 I snapped a few shots then scrambled down to get out of the cold. DAY 982 12.11.09 – I woke to a message from Natalie that said, “go outside and surprise yourself! enjoy the cold! embrace it! 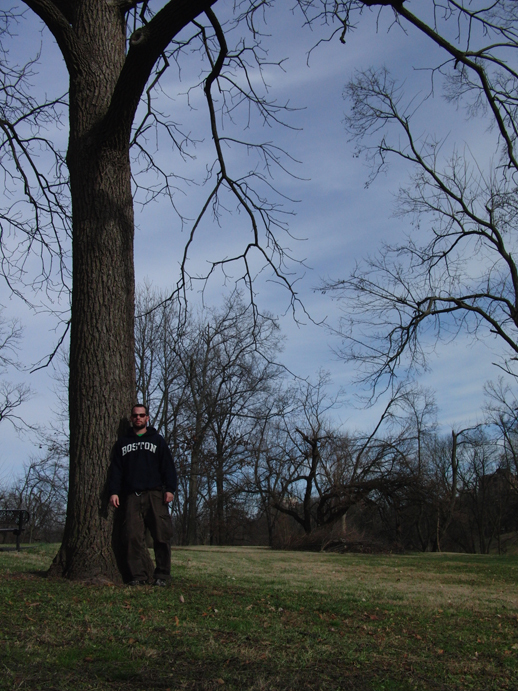 find something new and take a photo for me…” So I got dressed and went to Cherokee Park. I walked around in the morning cold with the sun shining and wondered around looking for something new. 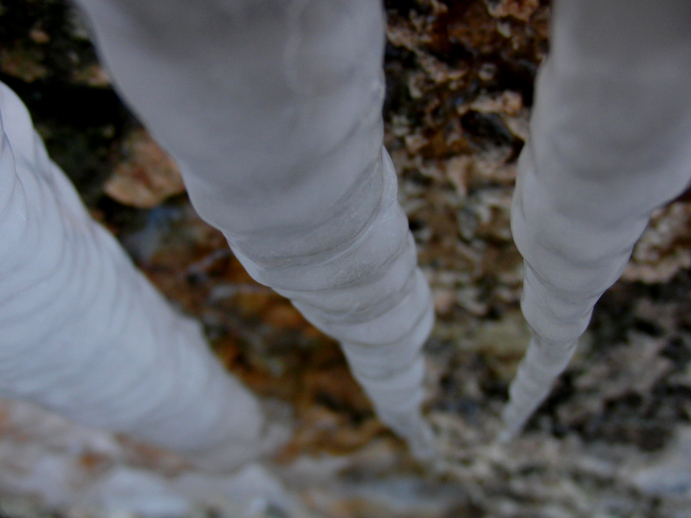 The ground was frozen and icicles hung from the cliffs. I took trail after trail and crunched through the brown leaves. Near the rear of the Seminary I found a tree debris graveyard. 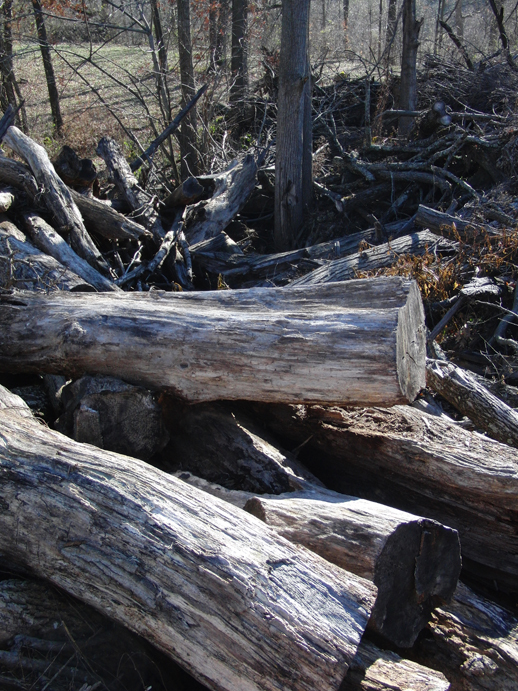 Mounds of cut limbs and logs. Near Big Rock I took a bunch of pictures of the icicles. 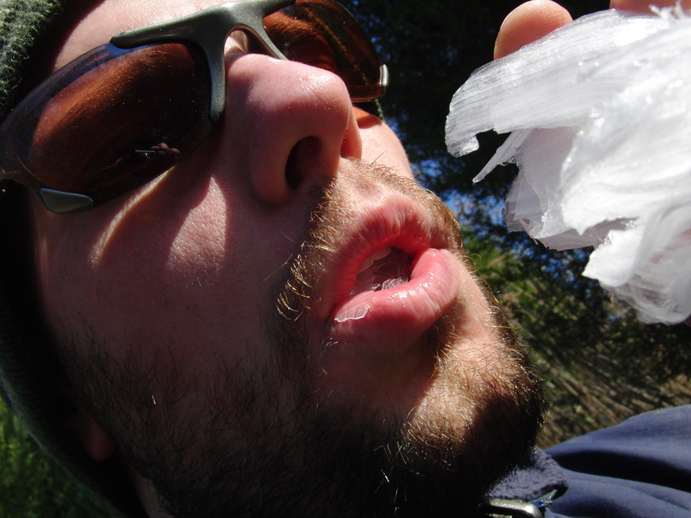 I also made a video of the water trickling behind the ice… view it here. I was feeling really good about what I had found and shot so I started to look for a tree to climb. I was eying the large Sycamores down by the creek and found one in particular that had a small tree growing next to it that I thought would make a possible transfer. 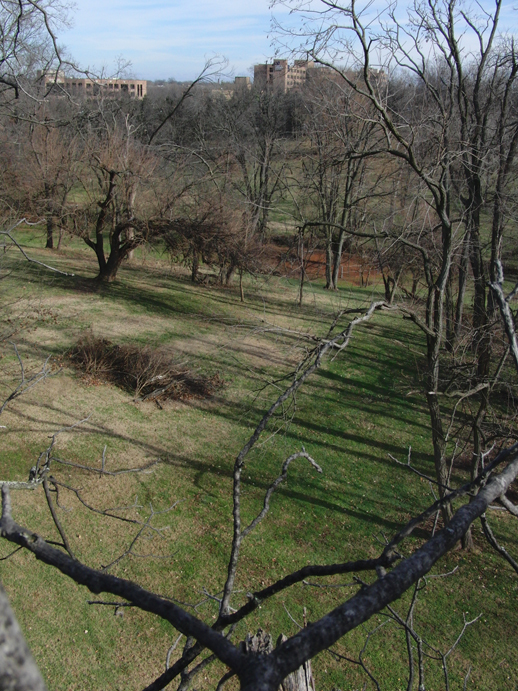 I went up, broke some weak limbs and started to really feel the warmth of the sun. 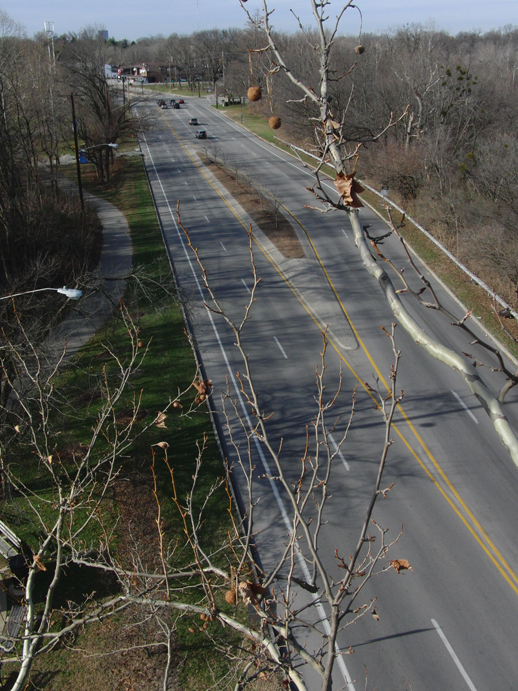 I got as high as I could go and realized there was no way I was getting to the large Sycamore. So I took some shots and then climbed back down. As I was walking back through the trails to get back to my truck I took a wrong turn on a path that lead me behind houses. So I turned back towards the park. As I walked slowly I came to an area of high weeds. 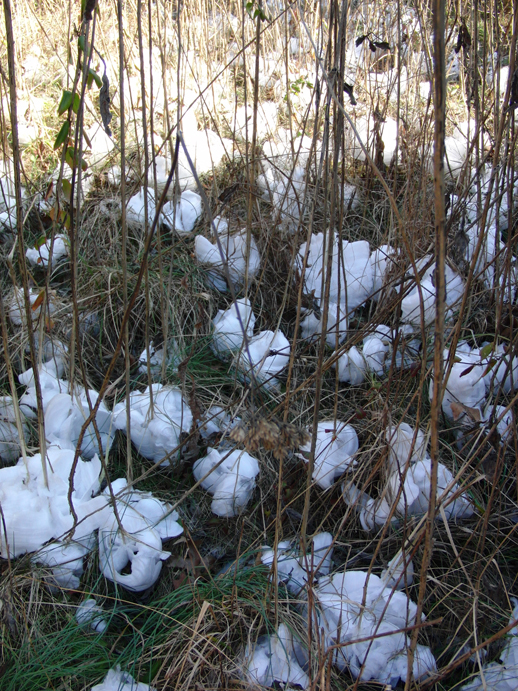 At the base of many of these weedy stalks I saw white plastic bags. I thought, What a shame! Who would tie these bags to the base of these weeds? I looked closer and was SHOCKED! These weren’t plastic bags at all. It was ice! 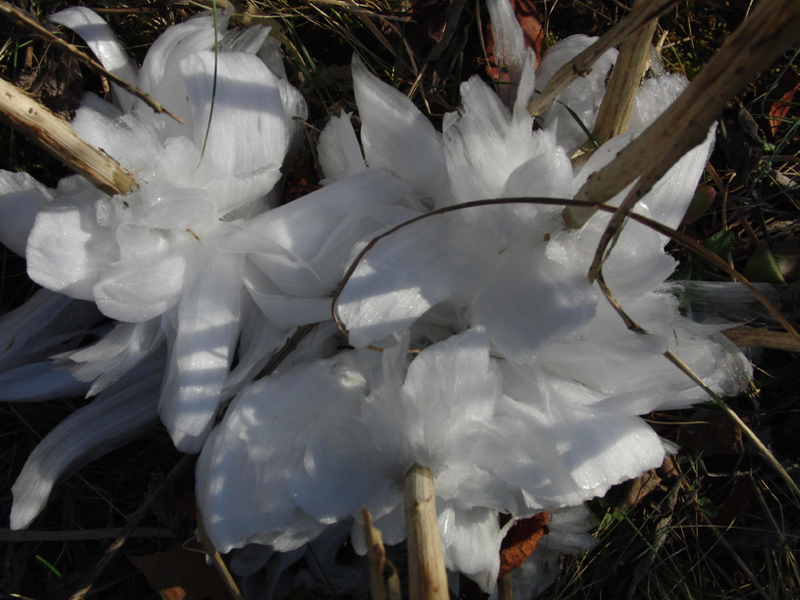 The cold must have frozen the water in this hollow stalks and pushed them out the bottom. What formed were curling ice sheets. 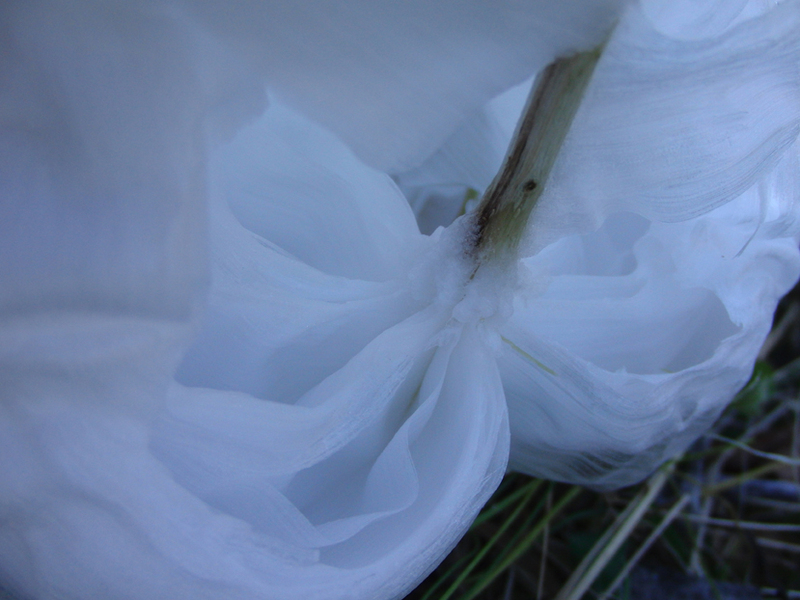 Ribbons of delicate white ice. I took my camera out and proceeded to shoot 300 pictures. Close up, far away, in my hand, really close up, all over. Every new one I inspected amazed me with its intricacy and delicacy. I had never seen this natural phenomenon in my life. What a treat. I even ate some when I got thirsty. I thought to myself, How did Natalie know I would surprise myself and find something new? I’ll let the pictures speak for themselves. View more of the images here. DAY 983 12.12.09 – I climbed a few trees today. The Sycamore by the parking lot off Lexington in Cherokee Park waiting for my fellow Traceurs to show for Parkour. 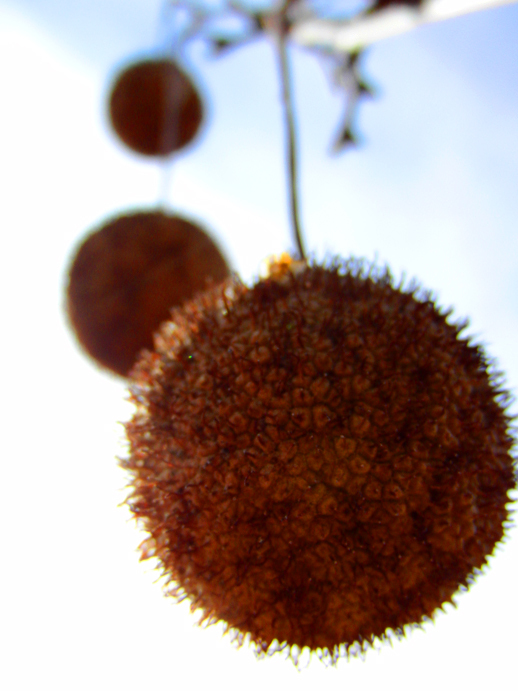 I got to the top and loved playing with all the seed balls dangling from the branches. 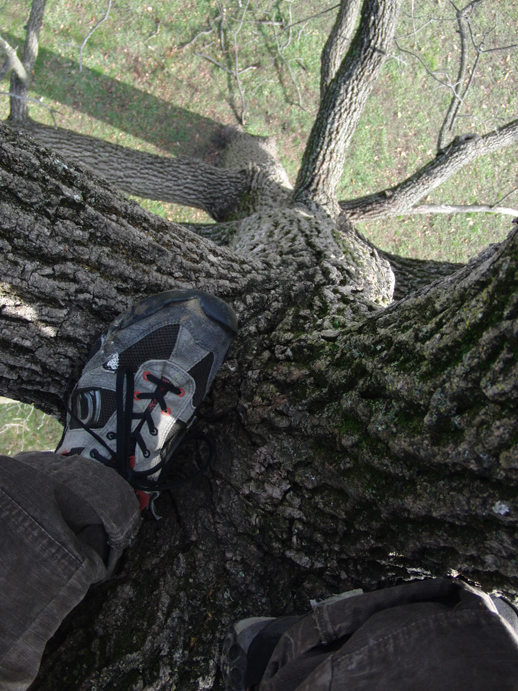 Then later near Big Rock I climbed another tree to get down some birthday balloons that got stuck. Mark joined me and went up another part of the tree. After I got down he was determined to shimmy up this one long branch to the top. He did his best but just got too exhausted and had to slide back down. It was a really good effort and I know next time he’ll do it. 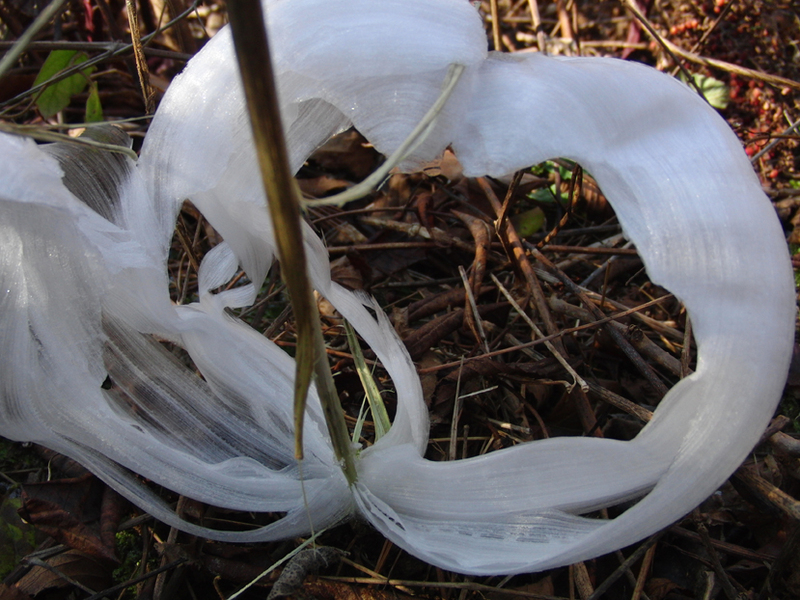 I wanted to show all of them the ice ribbons from yesterday but it was too warm and they had melted. DAY 984 12.13.09 – I waited till night and then walked down Frankfort Avenue to St. Joe’s. I have always wanted to climb there and I figured a dark cold night would be my best bet for going unseen. I hopped the tracks and the fence and walked in the shadows of the trees to the only tree I could see a possible path to climb. 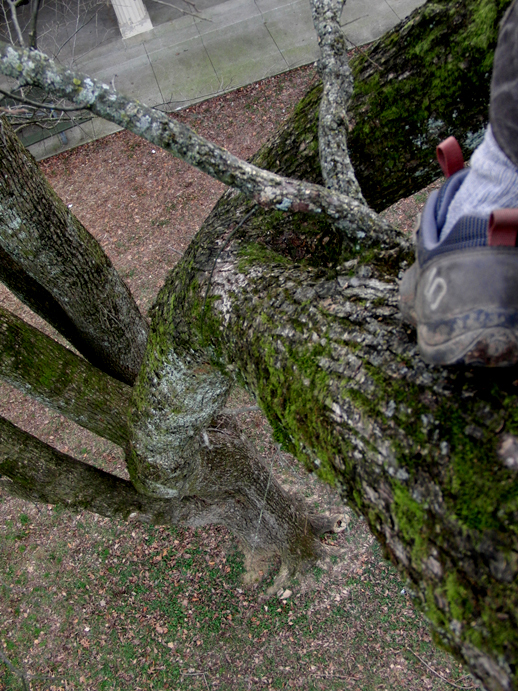 I went up the Maple carefully and quietly and stopped at the top to take in my view. It was a nice quiet night and it felt peaceful. I climbed back down after taking pictures and walked back home. DAY 985 12.14.09 – The weather turned warmer and the sun was out. I went back to Unique Imaging to pick up my print I had ordered a few days before and figured, since I was close, I’d go back to George Rogers Clark Park and shimmy that huge trunk. I parked and was glad to see there were no teenagers to watch. I prepared myself again for this looming challenge then thought, I should take a picture of me next to the tree. 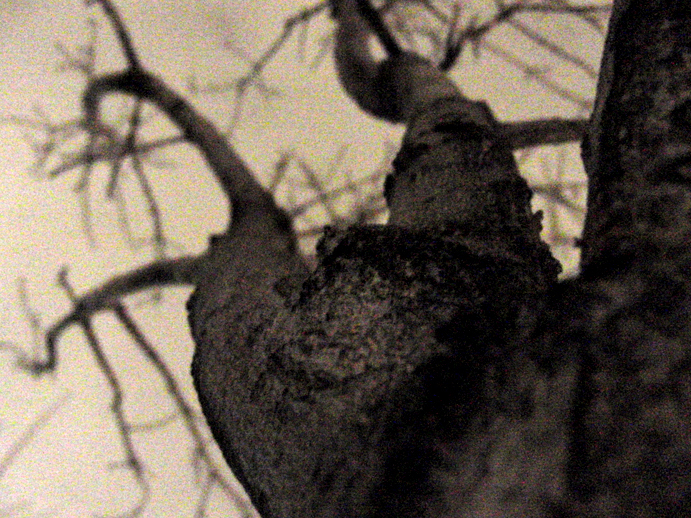 So I jammed the camera in a near by tree and propped it with a stick then set the timer and ran over to the tree. After I slipped the camera back in my pocket I got to the task. I inched and squeezed and hugged and soon I was just below the branch. I squeezed tight with my legs and reached my left arm over as I had done before and realized I needed a little more height. So I regripped and inched just a little higher. I reach up, got a decent grip and went for it and released my right arm and grabbed and hung. I did it! I wiggled my way on top of the branch and took a picture as I let my arms and legs rest. Then I climbed the rest of the way to the top. I picked some mistletoe from a high limb and dropped it to the ground. Then I sat in this nice three limb crotch and read my book in the sun and breeze. I stayed up there for quite some time, talked to my friend Charlotte on the phone and then finally decided it was time to climb down. I was a little nervous about the reverse slide down the large trunk but once I gripped and started to go, it was easy as pie. Another notch up the level of shimmying difficulty. It felt really damn good. 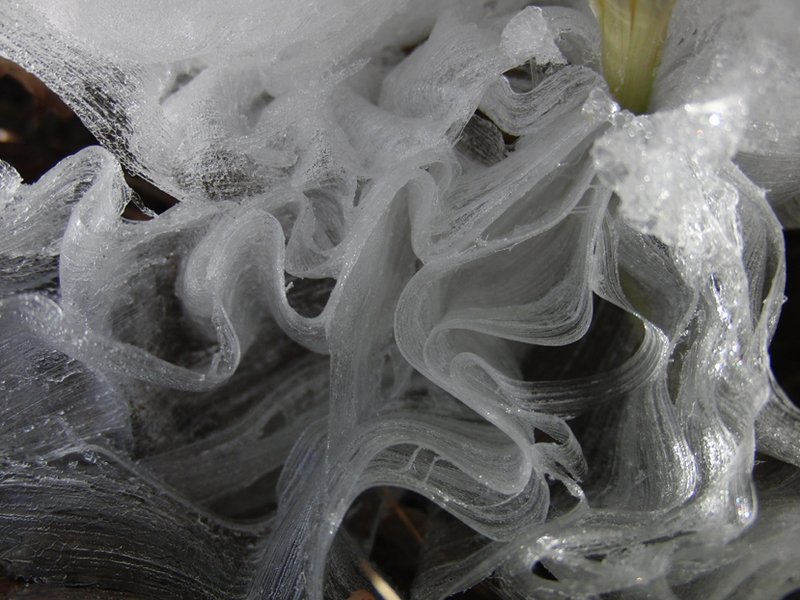 Awesome pics of the ice formations – they reminded me of Any Goldworthy. But my favorite part by far was the amazing view of the christmas toe socks! Perhaps you should start a separate blog dedicated to your choice of daily footwear? ?